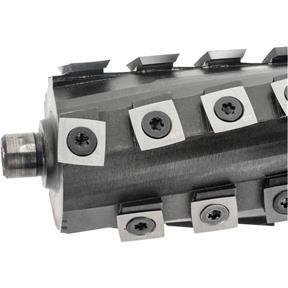 Manufactured in the USA by Byrd®, these indexable carbide insert cutterheads are very well made and leave a great finish. The inserts are positioned along a spiral pattern, and rotate at a slight angle for a shearing action that leaves a glassy smooth cut on the toughest of woods. 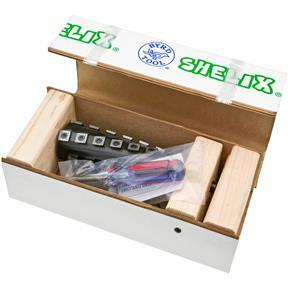 Comes with all 30 inserts on the cutterhead, plus 5 extras. The end insert seat is purposely machined at an angle to allow for rabbeting. Has a cutting diameter of 63mm. Although it looks different than the others, it does NOT interfere with normal cutting or leave any adverse cutting results. Purchased several months ago wish I had purchased several years ago! Amazing finish, I did not know what I was missing! Wow...what a difference from the standard cutterhead. The segmented head cuts EXCELLENT. The only problem I had was getting the old bearings off the old cuttehead. Used small bearing separator that worked well. Bearing/gear pullers did not. 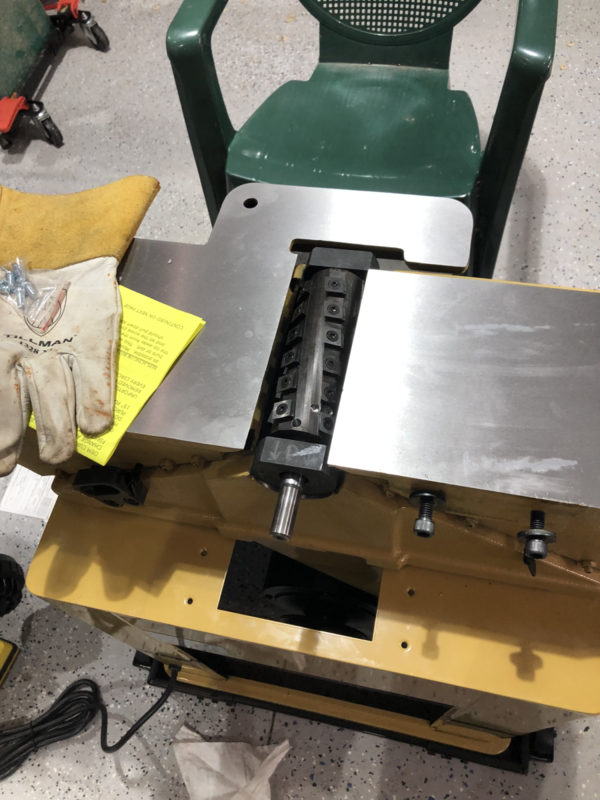 The reinstall of the bearings to the new cutterhead was quite easy and the head reinstall in the machine (jointer) was also easy. Have a Powermatic 54A. HIGHLY RECOMMEND THIS HEAD AND REPLACING YOUR STOCK HEAD. Bought this for my Powermatic 6" jointer. It was somewhat difficult to install, but that's just because the jointer is very well made. Once it was installed, it performed flawlessly. Smooth, quiet, and well balanced, I am very pleased with my purchase. Great product and great service by Grizzly. The only id on my machine is "1182-0228.A96" No date code on the motor. That said, I believe it was made in 1996. This Shelix head works perfect. Since the machine is so old I replaced the two bearings for $14 and now it works perfect. Couldn't be happier. Works just as well as the one I put into my Dewalt DW735 planer. If you read the description and talk to the reps. at Grizzly, they said it only works on machine made after 2003. Anyway, it was a win on my end. I wanted a new Jointer to replace my Rigid but I have already spent too much money on other projects at home. I bought this Shelix head and the difference is night and day. The replacement took about an hour and it was very easy. The wood glide through with ease now and I dont get those heavy shavings that would clog up sometimes. I highly recommend a replacement of the system youre working with does not need to be replaced. Very nice cut, wished I had bought this cutter years ago! Can't believe I waited so long to do this. By the way, you'll want to order new bearings along with this. It doesn't come with it. And if you don't have a bearing pulley, you might need one. Very nice. Pretty easy installation. Much nicer cut, and a lot quieter. Installed easily enough on my JET jointer, glad a went with a bit better product, cuts incredible vs the old straight blades Very pleased with performance. Took about two hours to take out old 3 knife cutter and install the Byrd shelix cutter. Boy what a difference in cut quality and noise reduction. I dont know why I waited so long to make the change. Outstanding! This is one of the best things I've bought. It is very easy to install and the only adjustment I made was to raise the outfeed table a little to level with the cutter. The cutters are extremely sharp. I cut myself right off just handling it.I would recommend getting new bearings to install while it is apart..... My thickness planer is next. Thank you, Grizzly and Shelix. I bought this cutter head a month ago. I mounted the head and as I spun the head by hand I noticed a wobble in the drive portion of the shaft. I tested it by actually mounting the pulley and powering the head. Vibration was far excessive. Communicated this fact to Grizzly, then Byrd. Had to send videos to Byrd to prove my case. Sent it back to Byrd within a week of receiving the head from Grizzly; there was a minor shipping label snafu. I was told replacement time was to be 4-6 weeks due to Byrd needing to machine new heads. The head I put on my planer works fine. The head for my jointer is missing in action and will be a while before it is actually reviewable. Whole experience has been disappointing and I'm not sure I would recommend purchase, not because of the tool, but because of the inexcusable delays in receiving product. When you send your steak back because it isn't right at the restaurant where my son cooks, it goes to the front of the line, a priority, and is rectified before everything else. Now that's what I call good customer service. Not so much here. An amazing upgrade over the standard 3 blade cutter head. Worth every penny. One of the best things I have bought for my shop. Very pleased with this cutter head. Install was fairly simple. Love it. A bit of work to install but fit perfectly in my powermatic jointer. Way, way better glue line finish than straight knives. No tearout at all. I'll never go back. After 10 years using the same knives on my Powermatic Jointer I made the call to upgrade rather than try and change the blades. This head is very quiet with better cut quality compared to the old blades. I purchased this for my Jet 6" Jointer planer. It installed easily, the only slight problem was the key slot was slightly smaller than the key that I removed. But a few minutes with a file and a few thousandths of an inch off the key fixed it. While I was replacing the cutterhead I also replaced the bearings and the v-belt as well. After alignment it worked perfectly and produced a very smooth finish. By the way this cutterhead has a 63mm cutting circle as mentioned in other review the circumference of your cutterhead should be about 7 7/8 inches or less. If it is larger, this is not the proper cutterhead. I bought this for my Ridgid JP06101 jointer. There is a little confusion as the cross reference shows this cutterhead fits a Ridgid JP0601 (there is a one digit difference in the model number) but it works fine as an upgrade on my Ridgid. 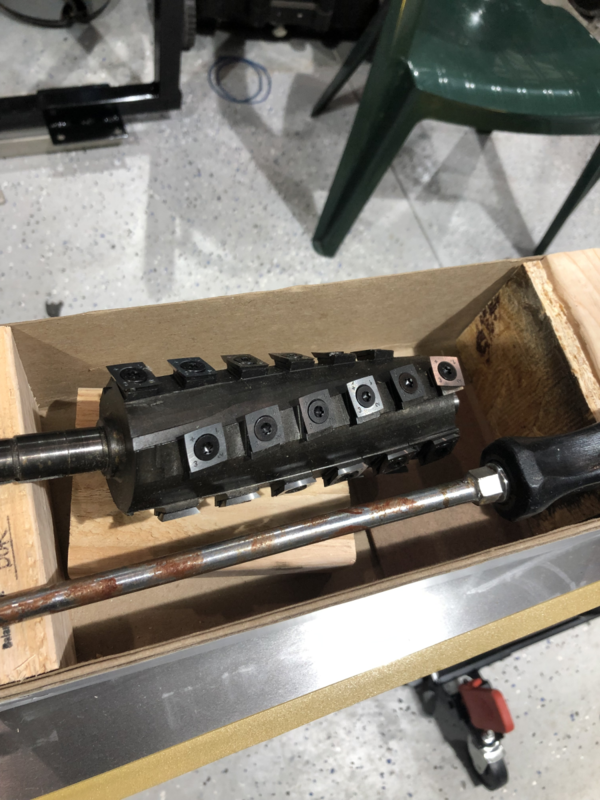 The shaft length where the drive pulley is installed is slightly shorter in length than the original head that came with my Ridgid jointer, but that wasn't an issue. 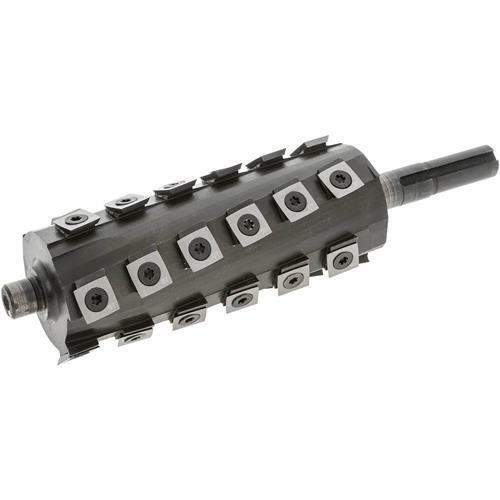 Shaft diameters where the bearings mount are correct and match the original cutter head. 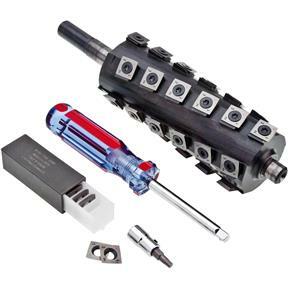 You need a gear puller to remove the bearings from the old cutter head and some way of pressing the bearings on the new Shelix cutterhead. I had a gear puller but had to modify the arms to fit under the bearings so it would work. I just used a deadblow hammer and a deep socket to reinstall the bearings on the new cutterhead. I also wore very heavy leather cloves when handling the cutterheads as the knives/blades are very sharp. I sanded the original drive key so it would fit in the new cutterhead's keyway easier, but still a snug fit. Removal and installation is a little tricky in getting the mounting bolts to line up, but patience is the key. Total time for removal and reinstallation including bearing swapping, probably about two hours. maybe a little longer. Runs quieter, cuts smoothly. I like it. Prior to this I had replaced the cutterhead in my Dewalt 735 planer with a 13" Shelix cutterhead. It too runs quieter and cuts smoothly. I was wondering about that. Were there any particular problem areas that I should be aware of? I forgot. I was talking about the 735 planer change over.